The Avid Technology CamCutter disk-based field system. There once was a time when shooting video in the field meant loading yourself down with very heavy gear. Early portables were usually two components - the camera and the videotape recorder. Adding batteries to this kit for power, made recording in the field an event that either built strong backs or ruined them. These days a much superior image can be achieved on a device that you can fit into your pocket. Almost everyone has access to a mobile device such as an iPhone, which is essentially a file-based video camera. Shooting Video With Your Mobile Device can introduce a whole new set of challenges. We've a come a long way, but it took a lot of different developments to get here. 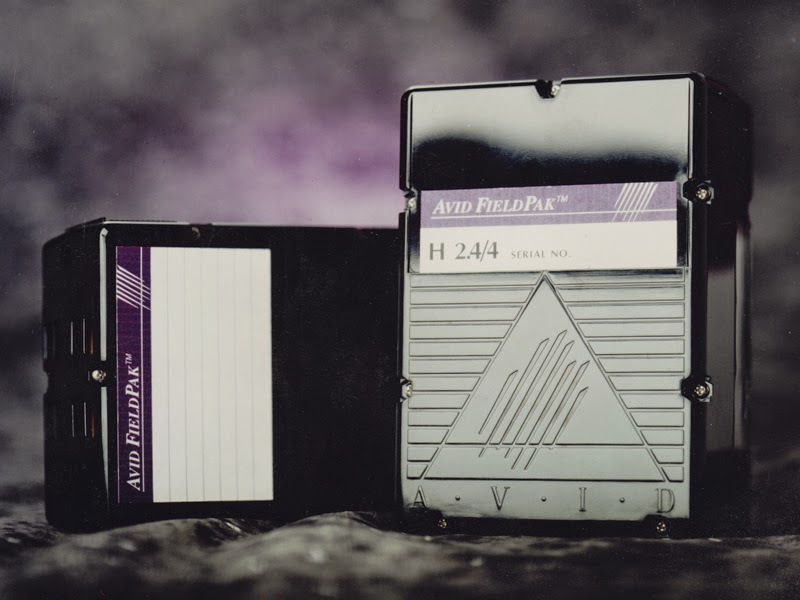 Back in the 90's when I was at Avid Technology, the company that pioneered nonlinear editing decided it was time to pursue file-based acquisition. This lead to the development of the world's first camera that recorded directly to hard drive. 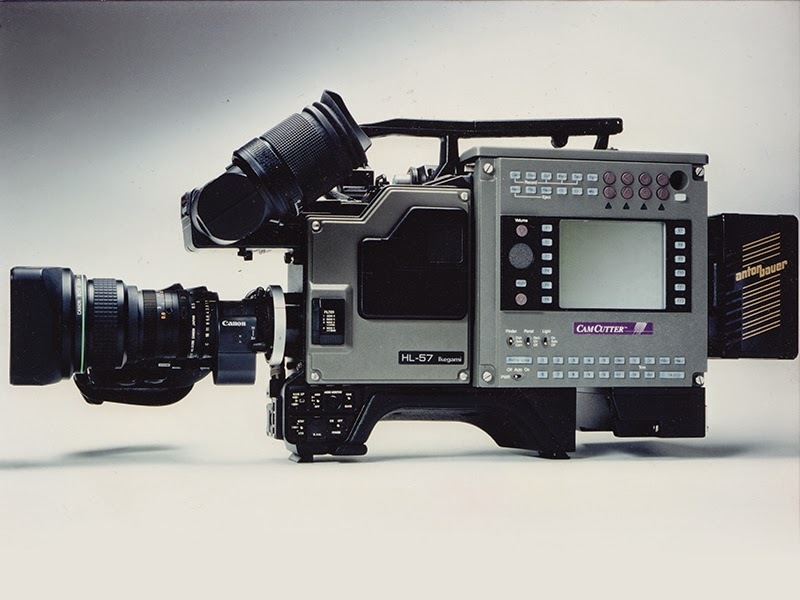 The CamCutter was a joint venture between Avid and Ikegami and was one of the first tapeless camcorders ever shown. Avid engineers had to develop a drive enclosure that could not only withstand the abuse from being in the field, but they had to develop a technique to eliminate the forces produced by the spinning drive. The solution was to place one disc on top of the other, spinning in the opposite direction. Doing this allowed the camera to move normally. When the camera was unveiled at the 1995 NAB show, there was still a lot of skepticism that a drive could be hardy enough for the field. This skepticism was all but eliminated when as part of the demonstration, the camera operator would throw a drive with new footage to the presenter and the presenter would drop it every time. The cost of media for the CamCutter made it a tough investment to justify compared to the cost of tape, but still there were early adopters who jumped at the chance to have a tapeless video workflow. Avid mo longer develops a camera, but the CamCutter has become Ikegami's EditCam which is still in production. Avid and Ikegami weren't the only companies to develop file-based cameras, but the CamCutter did pave the way for the tapeless systems we have today. As Jamie described, in a demo of CamCutter at NAB in Las Vegas, a camera operator would shoot a minute or two of the audience, pop out the storage module, and toss it to the presenter at the other side of the stage. The catcher would (purposely) miss the catch every time. He would then plug it into a Media Composer, and it worked over and over again. Near the end of the last day, the module hit the stage floor, and everyone gasped as it was clear that several pieces came out of the bounce! We were all certain the module had finally broken. The presenter picked it up. Strangely, there was no visible damage. Plugging it into an editing system, it worked perfectly. On further inspection, it was apparent that the storage module, after so many hits in the same spot on the floor, had taken a chunk out of the stage! That's probably tough enough for the news team.